The fun part about finger painting is making a big mess and getting colorful, gooey paint all over your hands. If you’re not crazy about letting your kids dip their digits in chemically concocted hues (we don’t blame you! 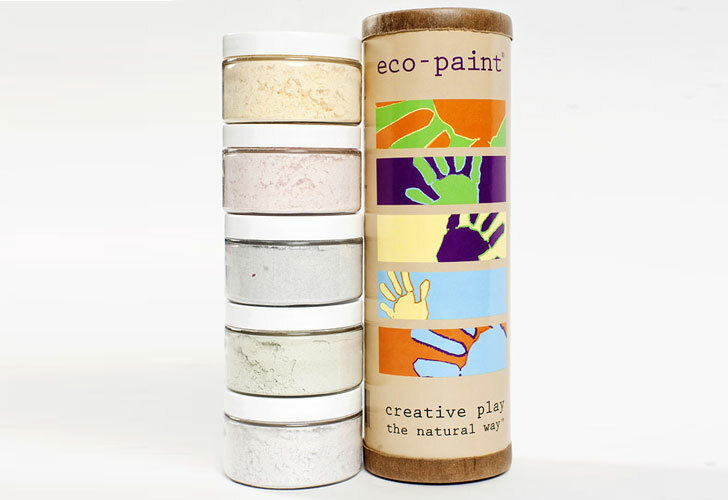 ), opt for eco-kids eco-finger paint instead. The powder-based paints are handmade with natural pigments from fruits, plants and vegetables such as curcumin, beets, spinach, carrots, red cabbage and purple sweet potato. Each set of finger paints includes 5 4-ounce containers. The original formula is made using wheat paste, but a gluten-free formula is also available. So go on, let your creative kiddos make a beautiful mess! The fun part about finger painting is making a big mess and getting colorful, gooey paint all over your hands. If you're not crazy about letting your kids dip their digits in chemically concocted hues (we don't blame you! ), opt for eco-kids eco-finger paint instead. The powder-based paints are handmade with natural pigments from fruits, plants and vegetables such as curcumin, beets, spinach, carrots, red cabbage and purple sweet potato. Each set of finger paints includes 5 4-ounce containers. The original formula is made using wheat paste, but a gluten-free formula is also available. So go on, let your creative kiddos make a beautiful mess!